California State Parks' peace officers not only patrol our state parks to make sure our visitors and staff are safe, but they also partner with other agencies on special events. This past weekend, rangers from the Off-Highway Vehicle (OHV) Division collaborated with El Dorado and Placer counties' sheriff’s office to make sure that off-highway vehicle recreation enthusiasts followed the OHV rules during the Marlin Crawler Roundup event on the Rubicon Trail. The annual event brings anywhere between 200–300 rigs (off-highway vehicles) each year. I was fortunate enough to tag along with State Parks Rangers Scott Struckman and Janessa LaBouyer and former State Parks Ranger, now a retired annuitant, Mike Smittle, and experience for the first time off-highway vehicle recreation on the Rubicon Trail—one of the most exciting 22 miles of off-road driving in America. The trail historically runs from Georgetown to Tahoma at Lake Tahoe. We began our off-highway road adventure on the Tahoma side and worked our way down to Rubicon Springs, where camp was set up and where the roundup takes place. As we made our way into the trail on the department’s newest two-seater razor, I quickly learned the trail is not for inexperienced drivers. The trail is rough and dangerous in certain areas, with large boulders to climb over, narrow paths, loose rocks, and steep hills. My partner and driver, Smittle, strategically placed each tire on the trail to make sure we made it safe down the steep hill, crawling over rocks in challenging terrain that seemed impassable from a distance. Smittle has driven on the trail several times and recommends that anyone new to the trail learn what their vehicle is capable of on the trail’s harsh environment. “Be with someone who can take you safely down and get you back in a vehicle that is capable of making the journey,” advises Smittle. Smittle along with Struckman and LaBouyer patrolled the trail, making sure participants were safe and to give infractions if they broke any of the OHV rules. The rangers made sure drivers stayed on the designated trail, wore seatbelts, and were not drinking and driving. They also looked for vehicle leaks to make sure they were quickly repaired. The Marlin Crawler Roundup, which has been around for 17 years, drew more than 400 people with roughly 200 rigs. The event helps sponsor the Rubicon Trail Foundation, which helps maintain the trail. Besides using the trail for off-highway vehicle recreation, outdoor enthusiasts can also hike and mountain bike along the path. Originally a Native American footpath, the Rubicon Trail was used by explorers in search of a clear path across the Sierra Nevadas. It started as an Native American trade route, became a stagecoach route, and is currently one of the premier four-wheel drive trails in the country. The first vehicle to drive the trail was 1908. Off-highway vehicles started regular use of the trail in the 1950s soon after WW II. Top: Placer County Sheriff's Officer Kevin White, retired annuitant and former State Park Ranger Mike Smittle, State Park Peace Officer Janessa LaBouyer, Placer County Sheriff's Officer Mike Mason, and State Park Peace Officer Scott Struckman. Bottom: LaBouyer, Struckman, and Smittle wave to the Placer County Sheriff's Office as they leave to patrol. Information Officer I Jorge Moreno poses with the deparment's newest off-highway vehicle making its first trek on the Rubicon Trail. Over the years, the site of the race would change from Placerville to Plymouth where in a few short years, the event outgrew that town. Finally in 1979, the Hangtown Classic would land at Prairie City Off-Highway Vehicle (OHV) park, which was at that time owned by Sacramento County. In 1990, the park would have new ownership under the state parks system. The Dirt Diggers North Motorcycle Club (DDNMC) along with District 36 of the American Motorcycle Association has from 1990 to this day worked together in order to host the once largest OHV event in the state. With so much history of past riders, racers, professionals and guests, Prairie City SVRA and the DDNMC wanted a new way to celebrate this unique past and commemorate the event. 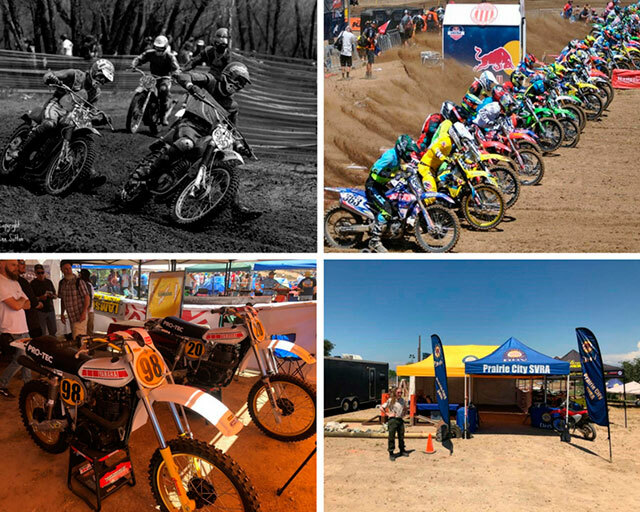 State Parks staff and DDNMC volunteers worked together to put on a vintage motocross display and history of the Hangtown classic mixed in with the Prairie City SVRA booth. Not only did Prairie City SVRA have its remote control car course, information about the park and the importance of protecting its environment, friends from local federal offices such as BLM and Forestry, but the booth contained 28 different vintage motocross bikes from different eras of Hangtown past. These included bikes like the BSA’s, Maico’s, Yamaha’s, Husqvarna’s and many more. All of these bikes were in mint condition, but two of the bikes were the only two of five replicas. The Yamahas that were on display were BP Racing Aberg Replicas. They are examples of the original Hallman/Pro- Fab Aberg Replica Yamahas - 4 stroke bikes, which are 500cc’s. These are two of only five replicas built utilizing the famous Pro-Tec stroker version of the Yamaha Engine. Each of these machines had their stories: bike number 20 was the first Aberg replica built by BP racing in 1979. It was raced by Danny Turner (2nd Open Pro AMA 4 stroke National Championships at Carlsbad) Billy Grossi (3rd Open Pro CMC 4 stroke National Carlsbad) and Eric McKenna (1st place Anaheim SX 4 stroke Invitational) between 1979 and 1981. Bike number 98 was built in 1979 by Ed Santin. It was raced by Steven Gall (3rd place Hangtown 4 stroke invitational) Billy Grossi (1st place CMC 4 stroke nationals Carlsbad) and Jerome Hybarger (1st place Hangtown 4 stroke invitational) between 1979 and 1982. While these bikes were in the center hub of the tents, there was a lot of Hangtown history surrounding them. This included more than eight different photo albums of newspaper clippings, and a poster for almost every year of the race. Even on display were vintage stickers from the races in the 70’s. Winners of previous Hangtowns were around as well to answer questions and be interviewed by motorcycle enthusiasts and magazines for the industry. While many of the parks in California have their own unique histories, Off-Highway Vehicle parks for the state have something that is truly different a past of diverse bikes, riders, and fans. 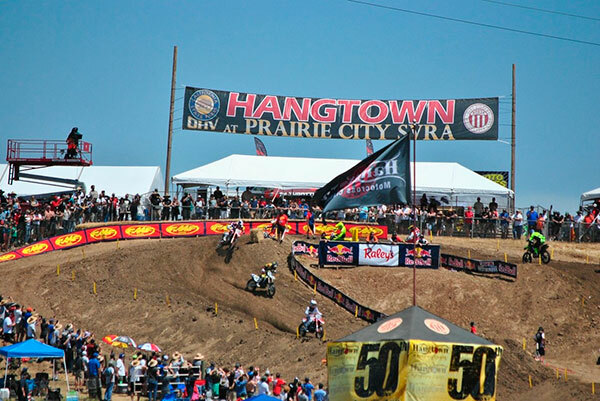 As always, we look forward to next year’s Hangtown here at Prairie City SVRA. If you would like to see a quick tour of our booth, click on our live Facebook. Top left: Hangtown 1977. Photo by Lee Sutton. Top right: Hangtown 2017. Bottom left: Vintage motocross bikes on display. Bottom right: Prairie City SVRA booth at this year's event. Colored photos by Tyson Dekker, Capital District and Peter Ostroskie, Twin Cities District. California State Parks reopened several off-highway vehicle trails at Mammoth Bar in Auburn SRA. Use of these trails is restricted to Sundays, Mondays and Thursdays during the summer season, and additionally on Fridays from October 1 through March 31 seasonally. The reopened trails include: Ranch, River Bar, Stonewall, Rocky, Castle Rock, Hillside, Squaw Flat and the 90cc Track. Non-motorized day use and river access at Auburn SRA is available seven days per week from 8 a.m. to sunset. Prior to reopening the approximately nine miles of trails, California State Parks conducted trails assessments, archaeological and biological surveys to ensure all maintenance of the OHV trails was in compliance with California environmental laws. The trails had been closed due to storm damage caused during the winter of 2017. The following trails will remain closed due to poor trail conditions: Eastside, Kennebeck, Grizzly and Hoosier. Auburn SRA intends to perform the necessary maintenance on Eastside in order to reopen the trail this fall. Another area that was affected by the winter 2017 storms included the motocross (MX) track. Approximately 15 percent of the MX track was washed away by flood waters. In an effort to relocate and reopen the track, Auburn SRA has been working with the Off-Highway Motor Vehicle Recreation Division, the U.S. Bureau of Reclamation and advocacy groups to create a plan to rebuild the MX track. At this time, there is no estimated date for repairing and reopening it. Updates on the trails and MX track may be viewed online on the Mammoth Bar OHV Area website. • Obey park rules, such as parking in designated areas and not entering closed areas. • Know the laws for off-highway vehicle recreation. • Use proper equipment such as protective clothing, goggles, a proper helmet and gloves. • Ride within your limits. • Approach curves and hills with caution. • Stop only in clear areas as fuel can spark fires in grassy areas. • Travel with a friend. • View wildlife from a distance. Never feed or touch wildlife. Once again, tens of thousands of off-highway vehicle enthusiasts traveled to Ocotillo Wells State Vehicular Recreation Area (SVRA) from all over the United States for the 56th Annual Tierra Del Sol Desert Safari. This two-day event brings together visitors from diverse backgrounds, OHV preferences and age groups. One thing they all seem to have in common is a love for their families, their desert and their sport. As you can imagine, an event like this requires teamwork and cooperation. From the event coordinators and core staff, to the ranger and the maintenance crews on the front lines. All the departments working together this year (and in years past) have made the 56th iteration of this event a clear success. In the run-up to the start of the event, our maintenance team worked on several projects to make the park ready and welcoming to our visitors. Fire pits were cleaned out, restrooms were painted and ramadas were in tiptop shape for the attendees to enjoy. The housekeeping team provided clean restroom facilities, made sure that refuse made it to the provided dumpsters and answered many visitors’ questions as they went about their duties during the event. Our trails team worked with the ranger staff and interpretation staff to make sure that all of the signage was in great shape for the event. This allowed visitors to know where they were and what they were looking at several locations. The trails team also partnered with our natural and cultural resources staff to pinpoint sensitive resources and provide barriers for their protection during the event. Resources staff was also instrumental in the approval of this year’s route that the TDS Safari followed, pre-running the entire course and providing their valuable insight to protect our park’s resources. Our park interpretive staff gave just over 2,600 visitors a peek into the secret life of the desert. Programs included a timeline of desert denizens, past to present and a flash flood safety display. The OHMVR Division Outreach Team came from Sacramento to offer support and host a Tread Lightly!® RC Jeep obstacle course that enthralled over 1,300 visitors of all ages. The outreach staff guided the participants over challenging obstacles while learning about OHV safety and Tread Lightly! principals, having fun and becoming more responsible recreationists at the same time! In total, approximately 3,900 visitors attended programs, forging new connections with their favorite place to play. Finally, overseeing the event from their perch on the Badlands Overlook, our public safety team kept a close eye on the event, with visitor safety as their ultimate goal. The public safety team used a Unified Command Structure as well as our newly finished Incident Command trailer to more effectively make use of our own and allied agency resources. Law enforcement rangers, desert lifeguards and officers from the multi-agency effort were able to professionally handle any situation that arose. With an increase in the number of law enforcement personnel this year, there were more minor citations issued. But due to the deterrent of more visible patrols, there were fewer serious incidents to report. Public safety team and allied agencies taking time for a photo after their morning briefing. 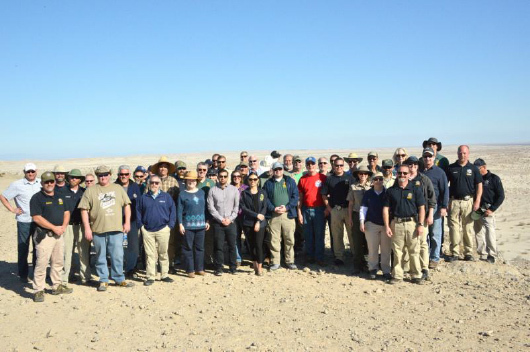 The Off-Highway Motor Vehicle Recreation Commission (Commission) held a public meeting in Holtville and toured Heber Dunes and Ocotillo Wells state vehicular recreation areas (SVRAs) last week. Off-highway vehicle (OHV) recreation groups, stakeholders, the public and elected officials, attended both the tour, held on March 1 and meeting on March 2. The first stop on the tour was Heber Dunes SVRA. This small, community-oriented park is a favorite destination for family gatherings and for people to enjoy both motorized and non-motorized recreation. Heber Dunes Sector Superintendent Kent Miller discussed how the park turned the 2012 General Plan into reality with dramatic improvements to facilities and the visitor experience. The commissioners were thrilled to see a new campfire center, restrooms, picnic areas, a youth track and training area, administration building, maintenance yard and related infrastructure. Representatives from the National Youth Project Utilizing Minibikes presented an update on a statewide partnership to utilize facilities like Heber’s for their youth programs. 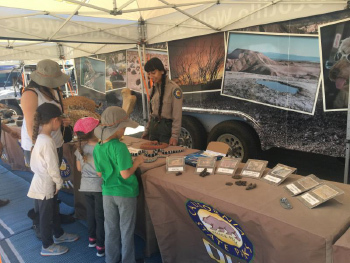 The partnership includes California State Parks, Honda, the National Forest Service, Bureau of Land Management and other organizations. The Commission then stopped at Tectonic Gorge overlook at Ocotillo Wells SVRA, where they could see most of the vast 86,000-acre park. There, Sector Superintendent Andrew Ahlberg discussed revenue generation, special event cost recovery and the public safety program. The incident command trailer and the desert lifeguard program were highlighted as key components in providing public safety services and inter-agency coordination throughout the year. 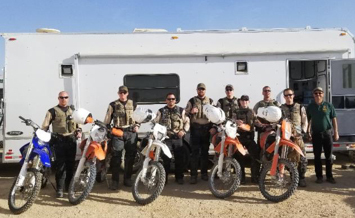 Recently, the Off Highway Motor Vehicle Recreation (OHMVR) Division and Rangers from across the State came together to help support the King of the Hammers off-road race. What is King of the Hammers you ask? King of the Hammers is an event so large and complex, that it requires the coordination of multiple Federal, State, and local entities to ensure its success. The centerpiece of the King of the Hammers race event is “Hammertown”. Hammertown is a maze of racers, pit crews, fans, vendors, concessionaires, security and emergency services, and all manner of support services that go along with a small city. Surrounding Hammertown you will find a sea of RVs, campers, tents, and any manner of campsite as far as the eye can see. This “city”, with a population of roughly 30,000, pops up virtually overnight. Picture this and you will begin to imagine the magnitude of this spectacle. This happens every year in the high desert region of the Johnson Valley. This is the perfect place for what is considered the toughest one-day off road race in the world. It is the largest off-road race event in North America in terms of both competitors and spectators. It combines desert racing and rock crawling, and has expanded from one race to a series of 5 races held throughout the week. These races include the Every Man Challenge , the King of the Hammers UTV Race, King of The Motos, the Shootout and culminates with the actual King of the Hammers race on Friday. The race is held primarily on lands administered by the Bureau of Land Management (BLM), but also extends in to the Shared Use Area, where Means Dry Lake is located. The Shared Use Area is jointly operated by BLM and the Marine Corps Air Ground Combat Center (MCAGCC) Twenty nine Palms. For 10 months out of the year, it falls under BLM jurisdiction, with two months allocated to the Marine Corps for training. In order to successfully manage an event of this size, BLM partners with the USMC Twenty nine Palms Provost Marshal’s office, USMC Conservation Law Enforcement Officers, San Bernardino County Sheriff’s Office, San Bernardino County Fire Department, California Highway Patrol, and California State Parks OHMVR Division to provide law enforcement and emergency services. King of the Hammers deployment team. Left to right: Ranger Jon Brandt (OHMVR Division), Ranger John Cunningham (Hungry Valley), Ranger Luke Ware (Ocotillo Wells), Ranger Cameron O’Quinn (Onyx Ranch), Ranger Scott Struckman (OHMVR Division), Ranger Anne Lewis (Angeles Sector), Superintendent Steve Schory (OHMVR Division), Ranger Eric “Rick” Hanson (Hollister Hills), and Ed Patrovsky (OHV Commissioner). Not pictured – Superintendent Callan McLaughlin (OHMVR Division). The newest addition to California State Parks is designated as an off-highway motor vehicle recreation park, but it offers much more. 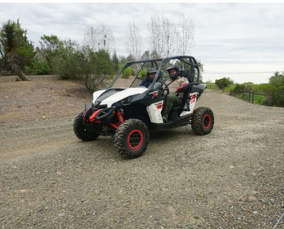 Eastern Kern County Onyx Ranch State Vehicular Recreation Area (SVRA) is the second largest unit in the Off-Highway Motor Vehicle Recreation Division. The park was acquired in 2014. Located in Eastern Kern County and adjacent to State Route 14 on the western edge of the Mojave Desert, this SVRA park offers over 26,000 acres of scenic and challenging terrain for all-terrain vehicles (ATVs), motorcycles, recreational off-highway vehicles (ROVs) and 4x4 vehicles. Laid out in a checkerboard fashion, Eastern Kern County Onyx Ranch is surrounded by mostly Bureau of Land Management (BLM) land that also offers visitors varied and exciting off-highway vehicle (OHV) recreation opportunities. The SVRA provides many miles of trails and open riding areas that traverse across BLM, State Parks, and private land. Open riding is also available at both Jawbone Canyon and Dove Springs. The road and trail system also provides for hiking, birding, wildlife viewing, rock hounding, mountain biking, and horseback riding. A portion of the Pacific Crest Trail traverses the park. Much of the SVRA is sage and scrub but trees vary from the spiky Joshua to pinyon pines. When winter rains cooperate, the spring wildflower bloom can be spectacular especially California golden poppy displays. Eastern Kern County Onyx Ranch has inspiring geological formations to view or explore. According the California Geological Survey the park sits on the western edge of the Basin and Geomorphic Providence. If you love camping, there are self-contained camping sites and additional primitive camping available at nearby Red Rock Canyon State Park. Known as National Reading Month, March also celebrates the National Education Association (NEA) month long reading celebration called “Read Across America”. Locally, two schools participated in this celebration by hosting their own “Read All Day” event honoring Dr. Seuss and his March birthday. 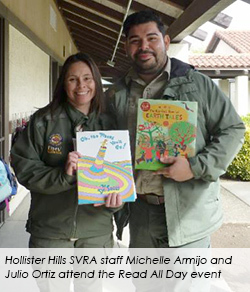 Both Cerra Vista and Sunnyslope Elementary schools invited Hollister Hills SVRA and numerous other agencies, organizations, and individuals from the community to read to students of all grades. For the second year, park staff happily participated at Cerra Vista on March 2 and for the first time participated at Sunnyslope on March 15. Both events were organized by school staff and allowed all reading participants the opportunity to read to one or more classrooms. It’s quite exhilarating to ride a side-by-side off-highway vehicle, especially if it’s your first time. The gravity of the full force pushes your body back into the seat as you take off on the unpaved road. As you make your way through the winding hills and dips full of mud, the wind and excitement rushes through your body. When you finish, you have a big smile on your face and clothes full of mud. 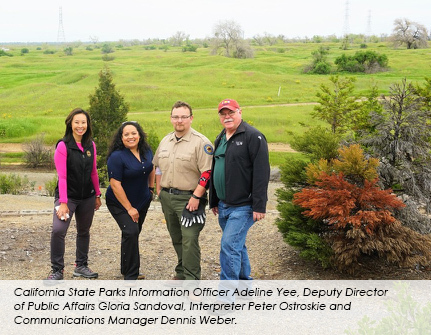 The Communications Team recently visited Prairie City State Vehicular Recreation Area to learn more about the Off-Highway Vehicle (OHV) recreation in our California state parks and rode on an off-highway vehicle with State Park Interpreter I Peter Ostroskie. Located on the base of the Sierra Nevada foothills about 25-miles east of Sacramento, Prairie City SVRA is an urban off-highway vehicle park with rolling hills, open grasslands and a unique habitat for wildlife such as hawks, wild turkeys and coyotes. The 1,300-acre park offers off-highway enthusiast a variety of terrains and trails for motorcycles, all-terrain and 4-wheel drive vehicles. “Because Prairie City is near Sacramento and other cities, it makes the park one of the best places for urban folks to come out and learn how to ride and to really love the sport of off-highway vehicles,” said Ostroskie. Ostroskie showed us around the Environmental Training Center (ETC) where he and others provide weekly classes to OHV recreationist. He educates them on the importance of environmental responsibility and safe vehicle operation. He said part of the training is to educate the public that in order to have a sustainable future you have to have sustainable recreation. “Environmental concerns are huge for us because we want to provide a place that people can recreate but also protect the natural resources,” he added. The ETC building has a trail system that features examples of different California ecosystems such as the desert, sand dunes and forest. This trail system teaches participants riding ethics to minimize their impact on the environment by emphasizing the importance of staying on designated trails. Aside from having fun while you ride, riding safely is also important. Using the proper equipment, riding within your limits, knowing the laws and wearing a proper helmet helps protect you and others from possible accidents. Although you might get distracted by the mud on your goggles, the park has amazing views and a unique habitat like the vernal pool. Flowers were blooming when Ostroskie talked about how these vernal pools are home to some of the last remnants of native grassland plants in the Central Valley. The seasonal wetlands are also home to some endangered species like the vernal pool tadpole shrimp and fairy shrimp.